I remember it vividly. I sat in a staff meeting anxiously waiting for my turn to share a proposal for a school wide initiative to improve student engagement and well-being. When it was my turn to speak, I stood up and passionately shared my ideas with my colleagues. When I finished speaking, I faced a room of people who sat in silence and made little eye contact with me. The principal thanked me for sharing my ideas and dismissed my call to action. I felt deflated, sad and discouraged. Shortly after, the principal opened the floor for discussion and additional thoughts. As the conversation developed, suddenly, John piped up and said “what if we try… and suggested the very ideas that I had just shared. “Great job, John!” “How brilliant!” “You always come up with the best ideas!” were phrases uttered by my peers. I couldn’t believe what was happening, but I sat in silence, in disbelief, but most of all I was angry. It wasn’t until recently that I came to understand that what happened to me in that staff meeting is known as a microaggression. Women face microaggressions on a daily basis. Consider when you are introduced to someone new and you share that you are a teacher and they comment on how you seem like the “nurturing type” or when you are regularly interrupted by the same colleague when you are speaking. For racialized women, there is the added layer of racism woven into the microaggressions we face, say, for instance, when a colleague or administrator insists you shorten or abbreviate your name to make it easier for others to pronounce or compliments you by telling you how “different and interesting” you look. These microaggressions can occur regularly within a workplace and often, because of their inadvertent or unintentional nature, may be dismissed or go unnoticed by perpetrators. They can also be normalized because we experience them from a variety of sources simultaneously, including the media, popular culture, friends, colleagues, teachers and even the curriculum. You ask, if microaggressions often go unrecognized, how will I be able to identify one? According to Dr. Derald Wing Sue, a psychologist at Columbia University, most microaggressions made towards women fall into three categories: objectification, inferiority and invisibility. Once I was given a definition of what seemed to be happening to me regularly, I began speaking to trusted colleagues about my experiences and realized I was not alone. “What she’s trying to say is...” This microaggression speaks to the underlying message that women, and particularly racialized women, need to be spoken for or are unable to articulate ideas in a way that others will understand or value. In my role as a reading coach, I facilitate many workshops and professional learning opportunities in which this often occurs. I even recall during a workshop I was co-facilitating with another woman of colour, having a white participant stand up to explain and extend our ideas and share their own work with the participants. “How did you get here?” Being questioned about my role, qualifications, length of teaching experience or my mere presence in a space or meeting occurs frequently. Research has shown that women in the workplace are routinely questioned especially when they are in leadership roles (Sue, 2010). This microaggression is rooted in the belief that women in leadership positions, particularly racialized women, are an exception not the norm and that our mere presence in a leadership role must be a result of some extraordinary feat. “You look upset, you should smile more.” This microaggression, for me, reinforces the stereotype of the angry, black woman. For other women, it may convey the idea that women should always be pleasant, happy and compliant. Regulation of my body language, behaviour and emotions is the microaggression that irritates me the most. Objectifying my body and attempting to tell me how I should or should not be feeling or reacting is deeply rooted in a history of women, especially racialized women, never having full autonomy over our own bodies. Constantly being interrupted. There are numerous studies that support the idea that men often interrupt women in the workplace when in conversation. A recent study out of George Washington University revealed that men interrupt women 33 percent more often than they interrupt men. The act of being interrupted is connected to the belief that what a woman may have to say is less valuable than what someone with more power and privilege might say. Being ignored by colleagues. Psychologist Anderson J. Franklin identifies the invisibility syndrome as the act of not acknowledging or valuing the talents, abilities and character of women. There have been many times that I have entered a room or walked down a hallway of a school and felt invisible after greeting colleagues with a “hello” or “good morning” and receiving no response. I can remember numerous occasions like the staff meeting incident I described above, where my ideas and thoughts received little to no response. “You’re strong, you can handle it.” This microaggression emerges frequently for me when in discussion with administrators about taking on teaching assignments or time-consuming initiatives. This microaggression, while often positioned by the perpetrator as a compliment, speaks to this underlying idea that women have to work twice as hard to gain half the recognition for the work they do. Often racialized women feel compelled to accept these challenges or find it difficult to decline additional work as a result of this. Research shows that when microaggressions occur regularly, they can have a significant impact on women. Feeling confused due to the ambiguity of an incident may be an initial reaction. An internal dialogue may also ensue. I know that when I am faced with microaggressive behaviour I reflect on the incident and ask questions to myself like “What just happened?” “What does this mean?” Engaging in this cognitive appraisal on a continuous basis can be exhausting. Going to work and having to deal with constant petty insults, demeaning behaviour and humiliations can be taxing both physically and emotionally. Microaggressive stressors may also lead the recipient to become hypervigilant and skeptical of perpetrators. This skepticism can lead educators to isolate themselves from some of their co-workers and cause difficulty in forming close relationships with others. I admit there were times when I felt safer not venturing to the staff room, burying myself in my own classroom and with my students, as a way to strategically avoid others than I did interacting with my peers. And when I did have to interact with my colleagues, I learned to conceal my true feelings and conform to the culture of the staff and school. These years of code switching and compliance led me to a breaking point where I felt angry and frustrated. No one should have to go to work and feel threatened, excluded, or isolated and as I wrote this article, I was nervous about speaking openly and honestly about this issue. I was fearful how this might be received by colleagues and administrators, and doubted my abilities to share my thoughts in an effective way. This fear and self-doubt result from years of being a target of microaggressive behaviour. As racialized women, however, speaking our truth is one of the most powerful things we can do in an attempt to create awareness of the issues we face on a daily basis. Addressing microaggressions in the workplace can be difficult especially when it means raising issues with people who hold power and influence over you. So the question becomes, what can you do when you are faced with a microaggression or you witness one? Acknowledging and addressing microaggressions in our workplaces can lead to difficult conversations. Microaggressions deeply reflect the systems, structures, policies and practices that drive our society. No one is immune to assumptions and biases. As we come to understand and acknowledge the systemic nature of microaggressions, we can all work together towards creating safer spaces for ourselves and our learners. 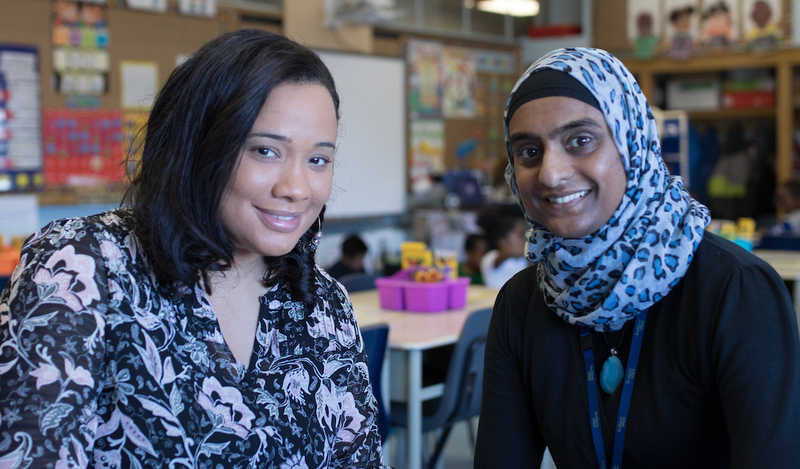 Angelique Cancino-Thompson is a member of the Elementary Teachers of Toronto. Pause and assess the situation. Consider your own safety and well-being before reacting to or addressing a microaggression. Ask yourself what you hope to achieve by addressing the microaggressive behaviour? Ask for clarification. Understanding a person’s intentions is important and often being asked to repeat what was said or done provides the aggressor with an opportunity to revisit and reflect on how their own actions might have been offensive. Lead by example. Treat others in the way you hope to be treated and be conscious of your own biases and behaviors. If you are witness to a microaggression being perpetuated against a colleague, acknowledge that it is happening. Create a circle of support. Find allies within your workplace. Being able to talk about what is happening with a trusted friend in an open and honest way can be extremely helpful when dealing with microaggressive behaviours. You may choose to strategize ways to address microaggressions with your ally, or they may lend support to you when they witness microaggressions occurring. Try to focus on what is said or done rather than making it about a person’s character. Addressing a microaggression can be met with defensiveness or dismissive behaviour. Develop your own strategy for response. While there is no singular way to deal with microaggressive behaviour, you will have to find your own way to respond in a manner that is most comfortable for you.